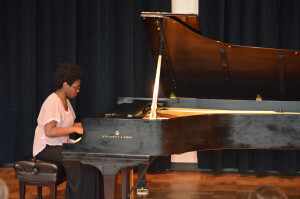 On Wednesday, April 8, solo and ensemble performances took place at 3 p.m. in the music building. 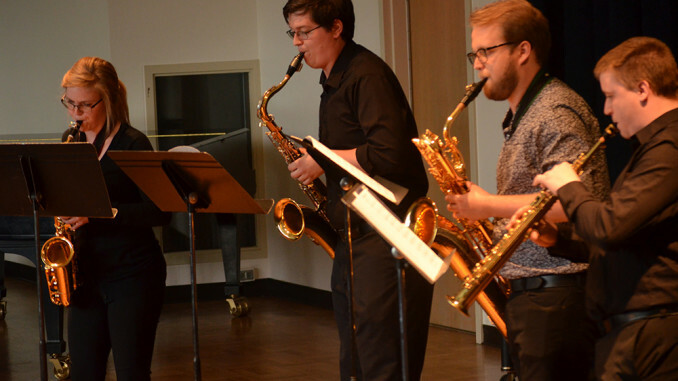 Community members, faculty and students gathered in Krieg Recital Hall in support of music students and faculty for the first general student recital of the month. 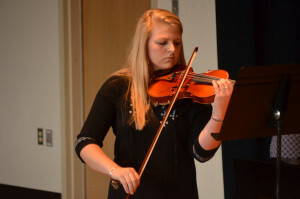 Some may see this recital setting as nerve-wracking, performing in front of instructors and peers, but for students like music education major Maklayne Vitovich, ’19, it is seen as a prospect for growth. She feels that the recital setting is a supportive and casual environment, and that these performances shine a light on the things she needs to work on and finely tune when practicing. As her freshman year comes to a close, Vitovich stated her gratitude for the opportunities that attending Wittenberg has provided her, such as General Student Recitals, OMEA Conference and working with the chamber orchestra Kremlin. 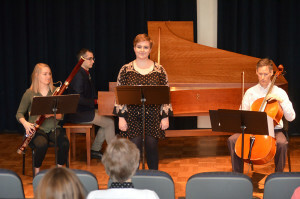 Vitovich was the first to perform, kicking off the recital with Johann Sebastian Bach’s “Aria: Jesus ist ein guter Hirt,” accompanied by Professor Daniel Kazez on cello, Professor David Crean on piano and Sophia Hulen, ‘17, on bassoon. Last, but certainly not least, was a saxophone quartet that sported an even balance of juniors and seniors: soprano saxophone Christian Babyak, ‘17; alto saxophone Lucielle (Lucy) Timko, ‘17; tenor saxophone Luke Mullins, ‘16 and baritone saxophone Austin Riggle, ‘17. The quartet performed Philip Glass’ “Concerto, No. 1” to conclude the concert. Timko feels that these General Student Recitals enable students to perform prepared music and demonstrate their talents in a supportive atmosphere. Timko feels that she was not put on this earth to perform, but to be an inspiration to the younger generations and share her love for music with them. She says that this doesn’t mean she doesn’t like to perform, of course; she just feels it isn’t her ‘forte,’ pun intended. General Student Recitals are a useful way Wittenberg helps students in the music department develop their musicianship and individual confidence.